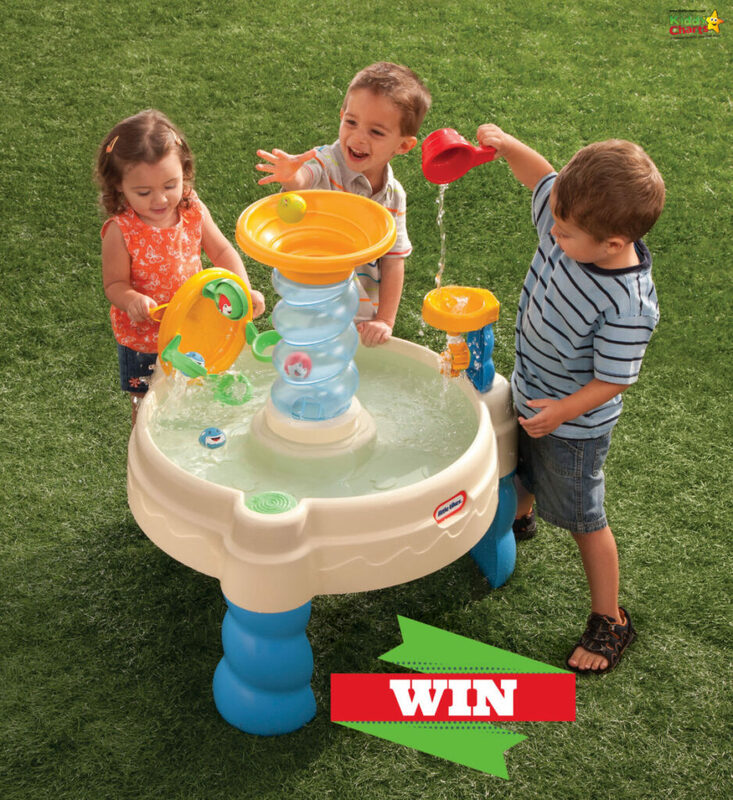 To celebrate the 50th anniversary of Little Tikes, we have teamed up with them to give away a Spiralin’ Seas Water Table. Watch your little ones thrive thanks to the hours of entertainment and imaginative play that come with this exciting water table. The water table is loaded with some great features that will improve fine motor skills, developing their understanding of sharing and spark their creativity. You kids can see how the water makes the wheels turn or simply splash around with the included fun water toys for kids! It’s the perfect height for toddlers as well – so they’ll be in their element with so much to see and do. Be careful you don’t have too much fun with them too 😉. Doesn’t this look just gorgeous, and so much fun for the kids as well – watch out for the bucket and balls coming your way with a big SPLASH! Commenting on this blog post if you can, to tell us why you would like to win the prize. Other than the fact it looks amazing of course! This gives you plenty of opportunities to enter, so more ways to win. As usual, you need to use the Gleam widget below for entries so that we can keep track. If you share the unique link we give you, you can also gain extra entries when people take part through that link too. Good luck. As always, it means a lot that you have popped on to our site and visited, and we hope that you have enjoyed entering this competition. Why not visit some of our other giveaways? We would love to have you again, so do sign up, either through the giveaway, or on our sign up page. We only send a newsletter once a week with a catch up on our articles. It gets a great open rate (20%), so we figure we are doing something right! Thanks again for visiting, and see you soon. It looks like great fun for everyone! I would love to give it to my little boy for play in the garden. We have our niece at our house two days a week. This would be a great addition to the garden in the summer months. She would get hours of use out of it, as she loves any kind of water play. i would love to win this for my nephew he would love it, i like the sensory aspect of it. my daughter is 3 now and loves water play – this would be fantastic to put out in the garnden during the warmer months to let her splash away day! I would love to win this for my Grandchildren, especially my Grand Daughter who has special needs. Water play is so valuable for all children, and especially important for sensory play, and of course lots of fun, and this looks like a natural for encouraging little ones to play together. My twin girls love playing with water and this product looks very exciting. It’s my little ones 2nd Birthday soon and I know he’d have hours of fun with this!! My little girl loves playing with water and playing in the garden. Love to treat her to this as expecting twins this July so my hands will be full, be nice to see her having fun with this. Thank you for the chance. Brilliant for my Grandson. Fun safe play. My little boy loves being outdoors and he would absolutely love to play this! Fab prize, this would give my kids hours of fun. l would love to win for our grandaughters they love playing in water and l know little tikes is always a good quality brand to buy them. This looks so good for my girls and is big enough with lots to do so they can both play on it at the same time. Perfect for our little garden too. Great prize for my niece. She turns two in April. This is such a fun prize, my niece and nephew would love it! My partners grandkids would have an absolute ball playing with this ! It would be perfect for my cousin to have in the garden in the Summer to keep her entertained. Lots of fun! I would love to win this for my niece. She recently moved to a new house with a garden, and so it would be nice for her to have some outdoor activity toys. Especially with summer coming. we are expecting our first child in Mau this week be perfect to put to one side for him!! I would love to win because Leo absolutely loves playing with water and at the moment his favourite game is spraying me with water from a plant sprayer. If we had this amazing table it would not only keep him unbelievably happy but would also keep me dry!! I would love to win this for my little boy! he loves playing in any water so I know this would be a massive hit with him. This looks amazing and perfect to keep the little ones entertained in the garden. I’d love to win as it would be great for keeping the grandchildren occupied when they visit. They would certainly have fun. I would love to win as it would certainly keep the grandchildren happy when they visit. They would have fun. The product looks like so much fun and would keep my grandchildren happy for hours when they come to visit. My little boy is about to spend his first summer outdoors and we would love to have something to play with in the garden. I look after my granddaughter when mummy is at work and she’d love this; grandma (me!) would love it too. She’s so adorable. Would love to win for my 2 terrors¥ have in the garden for the kiddies to enjoy lots of summer fun!! Fingers’ crossed for another scorching summer and a water toy like this would be perfect! Perfect summer fun we would be delighted to enjoy some water fun in the garden! My toddler is obsessed with water play, we have to play “car wash” everyday. This product looks so much fun and would encourage children to play outside. My nephews would absolutely love this – what a great prize. looks like loads of fun for water mad little people. son loves water. My 5 year old brother would love this. He’s obsessed with water. I would love to win this for my nephew because I love Little Tikes toys because they are always fantastic quality and last many years. Sadly due to disability I am unable to take my granddaughter out for walks.Having this waterplay feature in our garden will ensure fun in the fresh air without me having to worry about my mobility.Win win. We have one precious grandchild just starting to walk and she loves all things doll.But I like the fact the pram is sturdy and girly so safe for my peace of mind but will appeal to Layla for its femininity. Ith 3 kids under 5 why wouldn’t I want to win this?! What a lovely way to get kids outside in the sunshine! My 3 years old would love this. This would be great for my two small granddaughters. It would help them to engage in imaginative play and stop them relying on television and electrical devices. Mt adorable Grandson would absolutely love this! My twins boys n little girl would love playing with this together in the summer. They’d have a ball!! I’d love to win this for my twin grand daughters. They love water play, and this would be the perfect out door toy for them with the summer coming up. I’m faily sure that their big sister would also join in. The best looking toy I have seen in ages. Fabulous outdoor fun for the children that mum and gran want to join in with! what a great prize will be great for my son! This would be great fun – particularly if we have another gloriously hot Summer! I would love to win this as it looks good quality and fun to play with! I have five grandchildren. I can imagine them in the garden in the summer playing with this. Anything to get my little girl outdoors is welcome in my garden! This would be great to put in my garden when my granddaughter comes to play. My Beautiful laughing little granddaughters ,playing with this fun water toy.On a lovely sunny day . What lovely memories . It would keeps the kids occupied for hours and it’s something that they can play with togerher. This looks great for my niece and nephew. They will love the different ways to use the water, especially the spiral! I’m hoping to get this for my nephew, he loves messing about with water in the garden. A treat I would love to give my great-granddaughter. My little boy, Ted, who is 13 months and my niece who is 21 months, would love this for summer!! Foster carer to little ones and always looking for fun, stimulating, educational toys for them. Looks like great for for the warmer days! This would be great for my step-grandchildren next Summer! I would love to win this for my youngest as he loves playing with water. This looks educational and fun. I want it for my grandchildren, it would be a lovely thing for them to play with in my garden. My daughter has just bought her first house after renting a flat for so many years, the only trouble is they’ve never had a garden and the children are so looking forward to being outside in their own play area, they would be over the moon to have such a fun activity table to play with through the summer. I love that the water table is loaded with features that will improve fine motor skills, develop understanding of sharing and spark creativity. My son loves playing with water and he would really enjoy this with all the different activities, it looks great fun. This looks a fantastic toy for my kids, they love to be outside so this is perfect. I like the height of this as well the little tools to use so they can watch and learn how water moves. Great sensory toy! We love a day trip to the beach the best….. Terrific prize for kids – once the weather improves !! because my daughter is OBSESSED with water play lol! The grandchildren,and grandad,would have a lot of fun with this. Great prize for my little niece and nephew!